1) Mobile Compatibility – Back in 2005 mobile technology was in its infancy. But today it’s an integral part of everyday life. With the proliferation of tablets and smartphones, churches who use ChMS products have expressed the desire to use their software on these mobile devices. Churchteams ChMS has been an industry leader on this front. Every function and feature in Churchteams is accessible from any mobile Internet device. 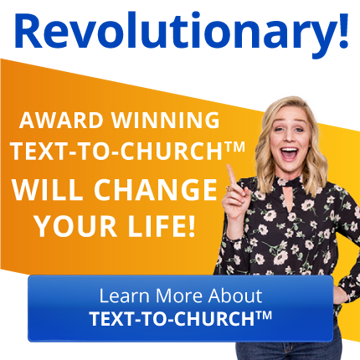 2) Texting-To-Give – Many church leaders have seen the need for text-to-give features and have asked ChMS companies to provide that functionality. By giving church members the ability to give via text message, churches can easily grow their giving base and improve their bottom line. That’s why Churchteams partners with Mobile Axept giving churches the ability to directly import text-donations into their contribution-tracking-database. 3) Volunteer Management – Recruiting volunteers and communicating effectively with them can be challenging, so church leaders want a ChMS product that will help with these necessary activities. Churchteams has dramatically upgraded their volunteer-scheduling functionality. Once the number and kind of volunteers are input into the system, volunteers can easily register for any roles and time slots that are open. 4) Tablet-Based-Check-In Systems – Children’s and volunteer check-in has been a common function from ChMS companies for a while, but the ability to check in on a tablet is rather new. Think of the counter space that can be saved by using tablets rather than laptops or bulky old desktop PCs. Or how about this idea: what will your church attenders think when a volunteer holding a tablet greets them and offers to help them check in? That kind of personal service will certainly leave an impression! Once again Churchteams is an industry leader with the development of their tablet check-in systems. 5) More Email Capabilities – No matter how much technology has changed in the last 20 years, email has stood the test of time. Few technological advancements in the last two decades have a long, proven track record like Email. That’s why churches use prolifically use email to communicate with their parishioners. Typically churches employ third-party email services like Mail Chimp and Constant Contact to send church-wide emails, but these products have monthly fees attached. With the hopes of cutting costs, churches have frequently asked their ChMS providers to include mass-e-mail tools to their product offerings. The Churchteams email system is powerful and it’s always improving. This saves their clients from having to pay for third-party email solutions. These features and more are all available with Churchteams. Our product is the same for every client regardless of church size for a fantastic value. To learn more click here.